"One could not have had a sweeter friend than your Mom. We..."
"Sincere heartfelt condolences to the Crosby girls and their..."
"Our condolences to your family. Frances will be missed here." and will be greatly missed." 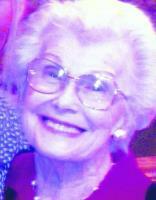 Fran Crosby, 91, passed away peacefully at home surrounded by her loving family. Born in Maynard, MA, she was a beautiful, kind and caring person who was loved by all that had the pleasure of knowing her. On the Fourth of July, 1945, Fran married the love of her life, Bob, when he returned from World War II. They enjoyed 68 years together in Vancouver, WA until his death in 2013. Bob and Fran loved spending time with family and friends and enjoyed countless hours playing golf at Green Meadows, where they were charter members. Fran is survived by one sister, Louise Grasberger of Tucson, AZ; her children, Peggy Hamilton, Joyce Potter (Dean) and Julie Hamilton (Todd); seven grandchildren; ten great-grandchildren; and one great-great-grandson. She was preceded in death by her parents, Harry and Helmi Dimery; three siblings; and son, Brian. A funeral Mass will be celebrated on Thurs., April 28th, 11a.m., at Our Lady of Lourdes Catholic Church. Mass will be preceded by recitation of the rosary at 10:15a.m. There will be a luncheon at the church immediatley folloing the service. Fran will be laid to rest at Evergreen Memorial Gardens.